Kickup snus is, like its name implies, a snus that gives your energy a kick. It’s full of ingredients that work to give your health a boost and get you up and running in the healthiest way possible. Forget coffee and cigarettes; Kickup snus is a health revolution that might just change your nasty habits forever. 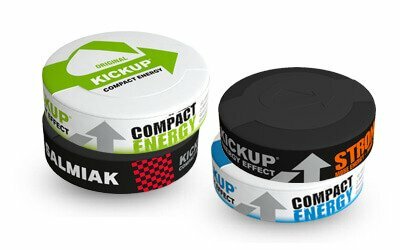 Kickup is a snus created for those who wish to enjoy a snus that doesn’t contain tobacco or nicotine. This is a snus made using tea leaves as a base, with added vitamins, minerals, ginseng and guarana. As with original snus, Kickup comes in a variety of options and flavours that are mixes of traditional snus flavours with a Kickup twist. Snus users will be familiar with the flavours of bergamot, mint, liqorice, and hints of fruity undertones that generally accompany their favourite snus and Kickup won’t disappoint with their new and healthier range. And there is also a white snus version that is drier and made using cellulose rather than tea. Kickup utilizes natural ingredients in their products. All ingredients are of natural origin, rather than the traditional nicotine, tobacco and taurine usually found in products of this type. Kickup chooses to use healthier options directly from a natural source. A benefit of this is that any effects will last much longer than its chemical or man-made counterparts. The first ingredient is BIOX20, which contains ten vitamins and three minerals. This offers numerous benefits, for example a long lasting healthy effect on the body. These vitamins and supplements fill up the energy storage capacity much more effectively, and again, with longer lasting effects. There are also antioxidants and micro nutrients in the Kickup snus. These natural ingredients help to protect cells within the body. It also contains guarana and ginseng, both of which are known for their stimulating effects. Guarana contains caffeine, and this is where Kickup gets its caffeine to add into the snus. This natural ingredient is a plant that originally came from Brazil. It was used for thousands of years by the indigenous people for medicinal purposes. It is associated with such positive effects as fat burning, preventing diseases, and stimulating the brain; increasing performance levels and much more. These short-term effects found in guarana come from the fact that it has a high caffeine and tannin content. In fact, a single extract of guarana contains up to 5% caffeine, which is a significantly higher amount than the amount of caffeine found in coffee beans. Coffee beans tend to contain only up to 2% of caffeine. These products that utilize guarana have a different influence on the body than that of caffeine products. As far as smoke free products are concerned, this is an excellent addition to the snus line. It gives a healthy dose of energy without the side effects of nicotine. It is a great product for those who love the feeling of a little pouch of something under their lip, but who are trying to reduce their nicotine intake. Owned by Winnington, the slogan is, ‘When you want a little more out of life!’ and Kickup is all about providing energy to people. Kickup snus is designed to reduce drowsiness and physical tiredness, and increase the ability to stay awake and have more energized thought flow and better brain activity. The brand has created a product that is a small, compact energy provider, perfect for those people with an active lifestyle. By using healthier alternatives in their products and ingredients, Kickup is actively trying to help people to stay healthy while still being able to continue enjoying snus. Having recently been bought by British American Tobacco, the second largest tobacco manufacturer in the world, this Swedish brand looks poised to take the world by storm.